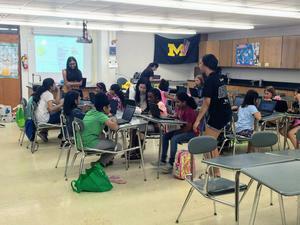 Okma students designed and facilitated a 2 week summer coding and robotics camp for middle school girls. 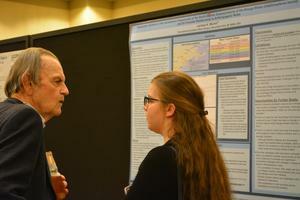 Larissa Michel (IA 2018) attended the 49th Annual Meeting and Conference of the International Association of Aquatic Animal Medicine in Long Beach, CA in late May, 2018, where she presented her research "Geographic Variation in the Vocalization Frequencies of the North Atlantic Subpopulations of the Beluga Whale (Delphinapterus leucas) and Its Possible Relationship to Anthropogenic Noise" during their annual scientific poster session. She and her poster caught the eye of many of the top experts and researchers in the field of Marine Mammology, so much so, that she was invited to accompany and participate with researchers next week in the long-running Sarasota Dolphin Research Project (Sarasota Bay, FL), when the scientists and veterinarians will be doing health assessments and research via ultrasounds, echocardiograms, blood draws, blubber samples, etc. on the resident wild population of bottlenose dolphins in Sarasota Bay. Michelle is one of "seventy Michigan high school women – who represent the state’s upcoming technical talent among female computer science students -- will receive Aspirations in Computing (AiC) Awards at ceremonies on Saturday, March 24, at Michigan State University." Go to your campus calendar page to subscribe to the online calendar. Be sure to check ALL CAMPUS EVENTS to include common dates/holidays.